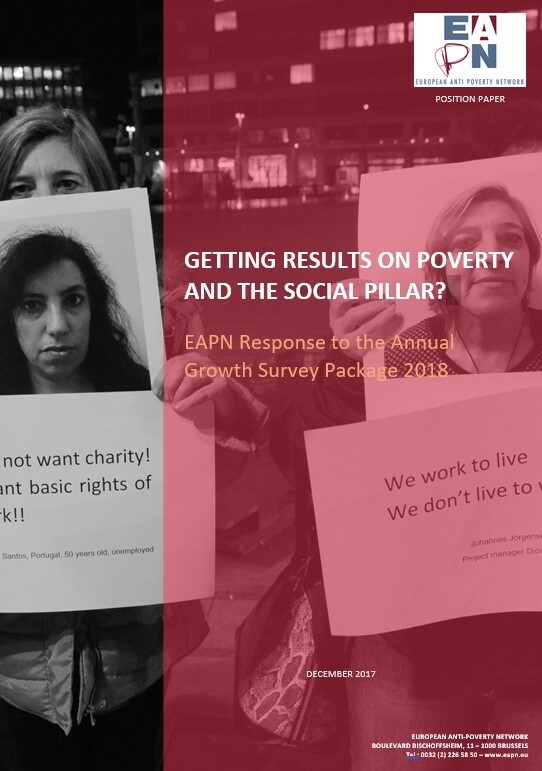 EAPN presents its full analysis of the 2018 Annual Growth Survey (AGS) and Draft Joint Employment Report. This follows a letter to President Juncker presenting EAPN’s proposals for the AGS 2018, which were based on our members’ review of the Semester and the NRPs 2017. Following the launch of the AGS 2018 in November, EAPN published an immediate Press Release: Participation is key to making Social Rights a ‘compass’ for the EU. This response now presents a fuller analysis of the AGS and the Draft Joint Employment Report, prepared in consultation with EAPN members. On 22 November, the European Commission adopted its ‘Autumn Package’, including the Annual Growth Survey (AGS) 2018 and the Draft Joint Employment Report (JER), and a proposal to amend the Employment Guidelines to bring it in line with the European Pillar of Social Rights. The main message from the AGS 2018 is that the EU is showing positive signs of recovery, and that structural reforms have yielded tangible results, enabling an opportunity to improve growth and jobs, and promoting economic and social convergence. The Pillar of Social Rights is said to be fully integrated, focussed on skills, equal opportunities in the labour market, fair working conditions, increasing labour productivity to support wage growth and adequate and sustainable social protection. It is meant to be a ‘compass’ for the Semester. However, as the 3 priorities remain almost unchanged from previous years – 1) boosting investment, 2) pursuing structural reforms and 3) ensuring responsible fiscal policies – with no mention of Europe 2020 targets including poverty reduction, concerns are raised about how far economic policies will be adapted to ‘put social rights first’, or whether the EU will continue to prioritize growth, relying on ‘trickle-down’ to promote social rights and inclusion, despite strong evidence of the failure of this approach. Make Civil Society equal partners in the Semester!